To achieve greatness in any field in life takes a combination of talent, dedication, discipline and good fortune. The sport of boxing is no different. Add to that list the importance of physical and mental strength and you have the recipe for a world class fighter. To see a boxer who possesses all these qualities is rare. To see a boxer throw it all away is heartbreaking. Boxing is a sport that requires a strong element of self-discipline. Some individuals like Bernard Hopkins and Dwight Muhammad Qawi used the discipline learned in boxing to change their lives. They went from nothing to something. Both men had served time in prison but used the lessons of the sweet science to keep them from returning to a life of crime. They became world champions and are true boxing success stories. Unfortunately, the connection between boxing and prison does not always take on a positive narrative. For every convicted criminal who uses boxing to change his life for the better, just as many boxers throw it all away and travel in the opposite direction. They go from something to nothing. In order to be a great fighter, one needs to possess self-confidence and a feeling of invincibility. However, problems arise when one fails to distinguish between the rules inside the ring and the rules outside the ring. Here is a list of five fighters who were undefeated and on the verge of greatness but threw it all away. For some, they felt their success in the ring placed them above the law and for others they could not leave their savagery solely in the ring. HARRY SIMON: Before Prison – Harry Simon represented Namibia at the 1992 Barcelona Summer Olympics and finished his amateur career with a record of 121-9. From 1998-2002, Simon was one of the best Jr. Middleweights in the world. In 1998, Simon defeated Winky Wright to win the WBO Light Middleweight title by majority decision. In 2002, Simon won the WBO Middleweight title. The fighter with a 23-0 record appeared to have a bright future ahead of him. Showtime had just started promoting him as a future star. Unfortunately, that all changed when he was involved in a serious car accident that resulted in the death of three individuals. Due to the combination of his injuries and his appealing the charges presented against him for culpable homicide, then his time served in prison, Simon entered the ring only once in the next eight years. After Prison – At the age of 38, Harry Simon commenced his comeback. He continually faced and defeated weak opposition back in Namibia where his name still garnered some recognition. Simon last fought in 2016. He is now 30-0, but at 45 years old, he is no longer a threat to contend for a title again. We will never know how good Simon could have been as his prime was wasted due to a poor choice he made while behind the wheel of a car. IKE IBEABUCHI: Before Prison – Ike Ibeabuchi immigrated to the United States from Nigeria in 1993. In 1994, he won the Texas State Golden Gloves Tournament in the Heavyweight division. He turned pro and won his first 16 straight fights. He was then matched against another undefeated fighter, the 27-0 David Tua. Ibeabuchi defeated Tua by unanimous decision and established himself as a top heavyweight contender. In 1999, he face undefeated future WBO Heavyweight champion, Chris Bird. He made easy work of Bird, knocking him out in five rounds. His career became untracked when people around him began to notice his behaviour becoming more and more erratic. He began insisting that people refer to him as “The President.” At the same time, he began to have run-ins with the law. He abducted the 15 year old son of his former girlfriend and then was involved in a car accident that caused permanent damage to the boy. He pleaded guilty to false imprisonment and received 120 days in jail. In 1999, Ibeabuchi was 26 years old with a 20-0 record yet he would never fight again. That same year, he was arrested on a number of allegations concerning sexual assault committed against escorts. Ibeabuchi was deemed incompetent to stand trial. Medical experts assessed that he suffered from bipolar disorder. He was convicted of sexual assault and served 16 years in prison. After Prison – Ike Ibeabuchi was released in November of 2015. After only 5 months, he was rearrested for violating the terms of his probation. Now 44 years old and still in prison, we will never know what he could have accomplished. According to Eric Raskin of HBO Boxing, “No heavyweight of his generation possessed more ability and no heavyweight of his generation possessed less stability.” As a result of his mental health issues, Ibeabuchi proved to be just as scary outside the ring as he was inside it. TONY AYALA JR.: Before Prison – Tony Ayala Jr. was considered a boxing prodigy. He compiled an amateur record of 140-8 and turned professional in 1980 at the age of sixteen. With a record of 22-0 (20 KO) Ayala was garnering national attention. He was a savage brawler who had caught the attention of the boxing world, much the way Mike Tyson did years later. On January 1, 1983 Ayala broke into the home of his neighbour and sexually assaulted her. Despite the fact that he was only 19 years old at the time, this was his third assault against women. Under the Repeat Offender Act, Ayala was sentenced to 35 years in prison. After Prison – Ayala was paroled from prison in 1999 at the age of 36. He proceeded to do the only thing he knew – boxing. He won his first six comeback fights all by knock out. Eventually, he was defeated by ex-champion IBF Super Welterweight champion, Yori Boy Campas. Though his comeback had been stopped, his trouble with the law continued. In 2000, he was shot in the shoulder by a woman after breaking into her home. In 2004, Ayala was sentenced to ten years in prison for probation violations. PAUL SPADAFORA: Before Prison – Paul Spadafora had an amateur record of 75-5. However, his professional career almost never got off the ground. As a passenger, involved in a car chase with police, he was shot in the Achilles tendon. Once he started focussing on his boxing career, he proved himself to be an elite talent. In 1999, the undefeated Spadafora was victorious in his showdown with Israel Cardona to win the IBF Lightweight title. He went on to defend his title six times. The year 2003 was the beginning of Spadafora’s downfall. His continual personal problems outside the ring ended up destroying his career. He was arrested in the shooting of his pregnant girlfriend and followed that up by running his car into a parked police cruiser while intoxicated. Add to that a drug possession charge and you have a career in a permanent holding pattern. On February 23, 2005, Spadafora was sentenced to prison for the attempted murder of his girlfriend. After Prison – After a 32 month layoff, Spadafora returned to the ring, winning his comeback fight by KO. Before he could fight again, he was back in jail for parole violations. Once again, upon his release, his extracurricular activities continued to hinder his boxing career. He was again charged with DUI, along with assault and brandishing a knife while making threats. In 2017, Spadafora had another run-in with law enforcement when he was arrested for assaulting his mother and stabbing his half-brother. As if that wasn’t enough, he was also charged with uttering threats against Pittsburgh police. Despite a world title and a 49-1-1 record, Spadafora completely underachieved. With his boxing career now over, Spadafora needs to work on getting his life in order. That will begin by completing a court ordered drug and alcohol program. EDWIN VALERO: Before Prison – Venezuelan boxer, Edwin Valero, compiled an amateur record of 86-5 with an incredible 57 knockouts. On February 5, 2001, Valero was involved in a serious motorcycle accident. He was not wearing a helmet and as a result, he suffered a severe skull fracture. He needed surgery to remove a blood clot. The injury prevented Valero from turning pro and even after his recovery, there were complications. 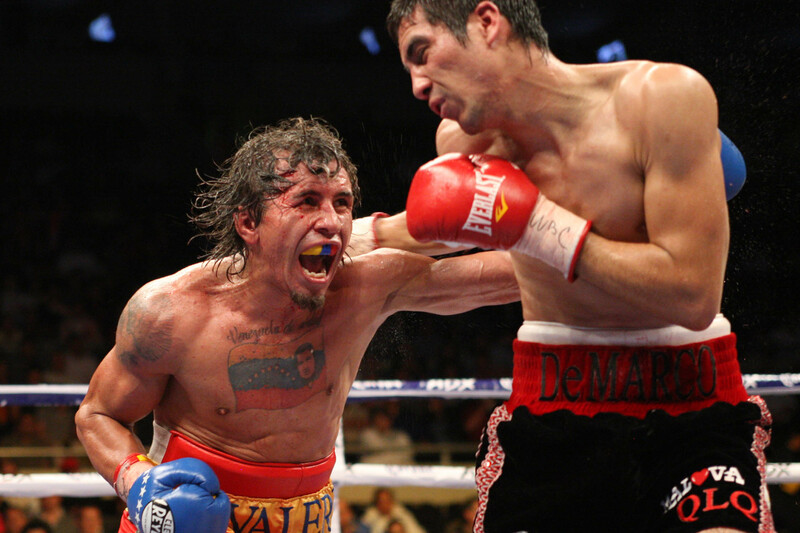 Due to irregularities in his MRI, he was not given permission to fight in the U.S.
Edwin Valero began his professional career fighting mostly in Japan and Latin America. He competed from 2002-2010 and amassed an amazing 27-0 record, with all his victories by way of knockout. Valero obviously possessed phenomenal power and fought with a high degree of aggression. The result: two world titles, an undefeated record, and emergence as a national hero in Venezuela. His manager claimed that Valero suffered from mental health issues and needed help. He also allegedly suffered from drug and alcohol abuse. Documents show that Valero’s wife had been admitted to hospital three times as a result of falling down stairs. His behaviour on her last visit was so volatile towards the doctors, nurses and police that he was sent for a six month psychiatric rehabilitation stint. Was this a result of his earlier motorcycle accident, from boxing or a combination of the two? We may never know for sure. Sadly, on April 18th, 2010, Valero’s wife’s body was discovered in a hotel. She had been stabbed three times. Valero was arrested after admitting to hotel security that he had committed the crime. After Prison – A day after being arrested, Valero was found hanging in his cell. The man who was invincible in the ring took his own life. Edwin Valero, much like Ike Ibeabuchi, needed people around him who cared more about him as a person than as a boxer. Ironically, the brutality and savagery that is responsible for the success of some fighters is also the characteristic that is responsible for the downfall of others. Boxing is a violent sport that attracts aggressive individuals. It is only those fighters who can leave or separate their life in the ring from their life outside the ring that truly prosper. Pirog, Hernandez, Simon and Valero’s Careers Ended as Champions! Sometimes a champion can only be stopped by injury or death. First we will look at Russia’s Demitry “Grandmaster” Pirog, 20-0 (15), who was WBO Middleweight champion. He gave up his title to challenge Gennady “GGG” Golovkin instead of his top contender Hassan N’Dam which cost him his title. In training he suffered a debilitating (ruptured disc) back injury and never fought again. His last fight was on May 1st, 2012 in his third title defense. Pirog is the only boxer to defeat (by stoppage) current WBA World middleweight champion Danny “Miracle Man” Jacobs who was 20-0 at the time and 31-1 (28) now with 11 straight knockout wins since this defeat. Pirog was 16-0 at the time. It was July 31st in 2010 when they fought in Las Vegas, NV, for the vacant WBO title. In his fourth bout Pirog won the Russian title defeating Sergey Tatevosyon, 25-5, by decision. In his eighth bout he stopped Juan Manuel Alaggio, 16-4-1, of Argentina. In his tenth bout he stopped fellow Russian Alexey Chirkov, 18-2, for the vacant WBC Asian Boxing Council title. In his eleventh fight he knocked out another fellow Russian Aslanbek Kodzoev, 20-2-1. In his next and twelfth bout he defeated Serbian Geard Ajetovic, 16-2-1. In Pirog’s next bout he stopped Kuvanych Toygonbayev, 29-4, of UZB improving to 13-0. In his next fight for the vacant WBC International title he ended the career of Ghana’s Kofi Jantuah, 32-3-1, in his first bout out of Russia in Saarland, Germany. This was followed with his first American opponent stopping Philly’s Eric “Murder” Mitchell, 22-6-1. Next he stopped and took the WBC Baltic title from Estonia’s Sergei Melis, 15-1. In what would be Pirog’s only US appearance is when he stopped Jacobs in Las Vegas. In his first defense of his WBO title he defeated Javier Francisco Maciel, 18-1, of Argentina. In his final bout he defeated the former interim WBA champion Nobuhiro Ishida, 24-7-2. Ishida in his next bout was stopped by Golovkin being the only one to stop Ishida in his now 40 bouts. Golovkin and Pirog were to fight August 25th 2012 on HBO. Pirog claims to have had a 200-30 amateur record. He gave up Chess at age 8 for something more physical which would start his boxing career. He has gone into training several times for a proposed comeback but could never get to the level he was when he stopped fighting. The second Champion was Cuban Yoan Pablo “Iron Man” Hernandez, 29-1 (14), held the interim WBA Cruiserweight title before winning the IBF Cruiserweight title. In September 2005 he lived in Germany where he started his career. In the pro’s he was trained by Ulli Wegner. In Cuba Hernandez fought from 2001 to 2005 and had quite a career. In 2001 he was a Cuban Jr. Champ. In 2002 he won the World Jr. Champion in Cuba. He lost that year to Cuban heavyweight Odlanier Solis. In 2003 he fought as a light heavyweight in the Pan Am Games going 2-1. He was in the 2004 Olympics getting a bye and losing in the second round. He then defected to Germany. In 2005 he was the Cuban National heavyweight champion. He had knee surgery for a rupture of the Meniscus of the right knee putting his professional career on hold. Turning pro Hernandez won his first 10 fights knocking out Thomas Hansvoll, 25-3-2, of Norway, who resided in Denmark in the tenth fight. In his fourteenth fight Hernandez won the WBC Latino title knocking out Algerian Mohamed Azzaoui, 22-1-2, of France. In his fifteenth fight he lost for the first and only time in his career to former WBC Cruiserweight champion Wayne “Big Turk” Braithwaite, 22-3, of Guyana and living in the US. In May of 2009 Hernandez defeated Aaron Williams, 19-1-1, of the US. In his next bout in October of 2009 he defeated Serb Enad Licina, 17-1, residing in Germany for the IBF Inter-Continental title. In February of 2011 he won the interim WBA title knocking out fellow southpaw Steve “Centurian” Herelius, 21-1-1, of France. In October of 2011 Hernandez possibly had his toughest fight for the IBF title held by Steve “USS” Cunningham, 24-2, of the US. Both were promoted by Sauerland of Germany. Hernandez wasn’t ranked in the IBF due to holding the interim WBA title so why was this fight made by their same promoter? In the first round Hernandez missed with a right hand but followed with a left dropping Cunningham who upon getting up rolled back on his side but beat the count of referee Mickey Van. For some reason due to the referee it took about 10 seconds to resume the bout when the bell sounded. In the second round and third rounds Cunningham became the aggressor in taking both rounds. With about 30 seconds to go in the round a clash of heads caused Hernandez to suffer a cut. The referee never stopped the action to inspect the cut. In the fifth round Hernandez hit Cunningham behind the head. By the time the referee got to the fighters Hernandez hit Cunningham behind the head again without a warning from the referee. The corner of Hernandez took the full minute then requested the ring physician to check the cut. Hernandez stood up looking to resume the action when the referee comes over to him and stops the fight telling both the decision will go to the scorecards. When the scorecards were announced the first judge had Cunningham up 57-56. The other two judges had it 58-55 and 59-54 for Hernandez. This writer had Cunningham ahead 58-55 only losing the first round. Cunningham walked around the ring with his hands in the air with his thumbs pointing down. Hernandez was later informed he would have to fight Troy Ross with the winner meeting Cunningham. Hernandez’s camp insisted on a rematch with Cunningham some 4 months later with the winner to fight Ross. The rematch was entirely different. Hernandez had Cunningham down twice in the fourth round and coasted to a decision win. After this fight he defended against Ross winning by decision. It was 14 months later before he fought again in 2013 when he knocked out Alexander Alekseev, 24-2, of UZB, residing in Germany in the tenth round. In August of 2014 he won a split decision over Firat Aslan, 34-7-2, of Germany. The fans were not happy with the decision. Both fighters complimented each other afterwards. The third world champion is Harry “The Terminator” Simon, 29-0 (21), of Walvis Bay, Nambia. He claimed to be 271-2 in the amateurs. One loss was in the 1992 Olympics. He was trained by Brian Mitchell and managed by Ellison Hijarunguru. On November 21, 2002, in trying to pass two cars Simon hit a car head on killing a couple and their baby. Simon had two broken legs and a broken arm. In March of 2007 he returned after serving two years in prison. Simon turned pro in 1994 in South Africa and after winning his first five fights stopped Enuel Marshile, 11-1. In 1995 he defeated Danny Chavez, 25-4-1. In 1998 he won a majority decision over Ronald “Winky” Wright, 38-1, for the WBO Super welterweight title. In 1999 to 2001 he fought out of the UK making a pair of defenses. In his third defense he traveled to Canada winning a majority decision over Rodney Jones, 24-2. In February 2001 he defeated Wayne Alexander, 15-0, who took the fight on 24 hour notice replacing Robert Allen. In July Simon moved up to middleweight beating Hacine Cherifi, 32-5-1, of France in Puerto Rico, winning the interim WBO title. In April of 2002 he defeated Sweden’s Arman Krajnc, 26-0, in Denmark. He would return in March of 2007 in Nambia as a light heavyweight winning over Stephen Nzuemba, 7-0, but didn’t fight again for a year winning two fights and appearing at 200 pounds in June of 2012 stopping Ruben Groenewald, 23-9, some 18 months later. He returned to light heavyweight a year later winning a pair of fights with the last one a 12 round decision over Serbian Geard Ajetovic, 23-8-1, for the vacant IBF International light heavyweight title. Simon would not fight again after September of 2013 a month before his 39th birthday. He had never been the same after coming back in 2007 after being off for five years but still never lost a fight. The fourth champion is Edwin “Dinamita” Valero, 27-0 (27), of Merida, VZ, who was found dead after hanging himself in a prison cell on April 19th of 2009. He admitted killing his wife the day before. In March of 2010 he had cracked his wives ribs and punctured her lung. Upon visiting her at the hospital he made a commotion and was arrested. Valero’s amateur record was 86-6 (45). On Feb 5th 2001 he had a motor cycle accident and fractured his skull. This could be the reason he eventually went bad. He would hold the WBA Super featherweight title defending it four times. He won the WBC Lightweight title and defended it twice. Both Golden Boy and Top Rank promoted him. Valero turned professional on July 9th 2002 and won his first 18 fights all in the first round. In his 18th fight he stopped Whyber Garcia, 17-3, of Panama in an elimination fight for the WBA Super featherweight title. He also won the WBA Fedelatin title in February 2006. Valero knowing he wouldn’t get the title fight for six months he took another fight one month later in Japan stopping Mexican Genaro Trazancos, 21-7, in the second round. In August of 2006 he won the WBA Super featherweight title stopping Panama’s Vicente Mosquera, 24-1-1, in the 11th round. He had Mosquera down twice in the first round and was down himself in the third round. Valero made three defenses in 2007 with the first two in Japan and the third in Mexico. In April of 2009 he won the WBC Lightweight title stopping Colombian Antonio Pitalua, 47-3, out of Mexico knocking him down three times in the second round in Austin, TX. It was his only title bout in the US. In December of 2009 he made his first defense winning over Hector Velazquez who didn’t come out for the seventh round. In February of 2010 he had his last fight stopping Mexican Antonio De Marco, 23-1-1, who didn’t come out for the tenth round. In the second round an accidental elbow from De Marco opened up a large gash on Valero’s hair line which seemed to make him fight even harder with blood covering the right side of his face. Plans for Valero meeting Manny “Pac-Man” Pacquaio were in the making later in the year. In January of 2004 Golden Boy took him to New York where a small blood clot was showing in his brain. He was suspended and would be off for 17 months. This was one “wild man” who was in 8 world title bouts. He fought in VZ 12 times, Japan 5 times, US 4 times, Mexico and Panama twice each and Argentina and France once each. He was one of the few champions to end his career undefeated.